[R65R, Bogus Basin] was abuzz with activity this summer as the ski area tore down its old Superior Chairlift in order to erect a new high-speed quad. The community in Boise, Idaho has rallied with financial support for the new $5 million lift at the non-profit ski area. Dismantling the Superior Chair, a 1960s-era double lift, started last spring. "Late spring snow came and went several times, but just as soon as we could get in there, we tore it out," Bogus Basin Spokesperson Gretchen Anderson said. Work to install the new Dopplemayr lift is progressing on schedule this fall, with towers expected to be flown in this October. "The footings are now in, and we're waiting on the last pieces of equipment to arrive from Canada and Austria," Anderson said. The new lift will be the third high-speed quad at Bogus Basin, providing one fast lift on each side of the mountain. As a non-profit charitable association, Bogus Basin sits in a different financial position from other ski resorts. "We meet our budget with season pass and ticket sales," Anderson said. To install a new lift requires loans and fund-raising from the community. 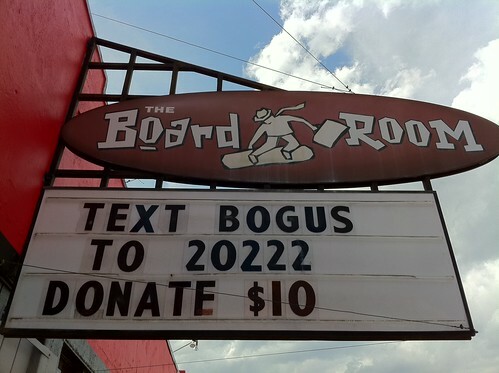 One fund-raiser for the new Bogus Basin lift includes the Text-to-Donate program. Photo courtesy of Bogus Basin. The ski area association was able to obtain a 20-year loan from Home Federal with a USDA guarantee on the condition that the association raises the 20 percent to put down on the project. Last spring, Bogus Basin launched a series of fundraising projects to come up with the $1 million necessary for the project's down payment. "We have about $850,000 raised so far," Anderson said. "We had some sizeable contributions from individuals and corporations. The entire community has really stepped up." Fund-raising efforts have included a text-to-donate $10 program, and 2011/2012 season pass purchasers can receive a special donor pass coded black, blue or green, depending on the level of contribution. The new lift, which services intermediate and advanced terrain, is on schedule for completion by opening day this winter. "The lift will change how people use the Superior side of the mountain," Anderson said. "They'll get so much more over there on powder days and twice the amount of skiing and snowboarding that they did before." To learn more about Bogus Basin, click here.